Born 100 years ago today, the University of Alabama legend was the greatest college football coach ever—and he still influences every level of the sport. Fred Thompson's character Arthur Branch once said in an episode of Law and Order that “If it wasn’t for that sonuvabitch Bin Laden, we’d only remember September 11 as Bear Bryant’s birthday.” Today, many people throughout the world of college football—and especially in Alabama—will make Branch proud by not letting Bin Laden spoil the centennial celebration of Coach Paul “Bear” Bryant’s birthday. 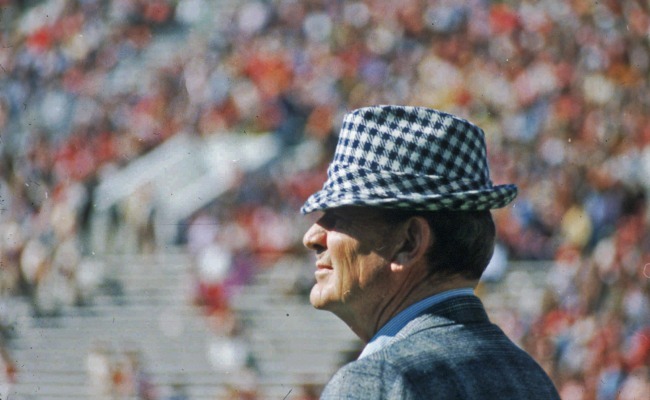 While working on Mama Called, a new documentary of Bryant’s life, I found myself pondering a question which I had asked myself many times over the years: Was Bear Bryant the greatest college football coach of all time? In the time since his death in 1983, it has become more and more obvious that he was. Two other coaches of major college football teams passed him up in the all-time victories list—Joe Paterno (409) and Bobby Bowden (377) won more games in the major college ranks—but Bryant’s won-lost percentage is considerably higher (.780 to Paterno’s .749 and Bowden’s .740). Bryant won more national championships (six) than Paterno and Bowden combined (four). And for what it’s worth, Bryant was 4-0 in head-to-head matchups with Paterno. Paul Bryant coached at four universities and completely turned their football programs around for the better. Maryland was 1-7-1 in 1944, and then, in Bryant’s first and only season as head coach, went 6-2-1. Kentucky was 2-8-0 in 1945; in Bryant’s first year, 1946, the Wildcats were 7-3. In 1953, the Texas A&M Aggies were 4-5-1. When Bryant got there the next year, he gutted the entire squad and rebuilt it practically from scratch; the Aggies finished just 1-9 in 194, but Bryant’s labor bore fruit the next year, when they jumped to 7-2-1, and in 1956, they were the Southwest Conference Champions at 9-0-1. The Alabama Crimson Tide were 2-7-1 in 1957 to 5-4-1 in 1958 under Bryant, and, of course, the rest is history. The vast majority of college football historians have also overlooked the fact that Bryant is the only coach to have achieved greatness in both the era of limited substitution (or one-platoon football, as it was called, when all players had to spend some time on both offense and defense) and the era of unlimited substitution, the modern era of football when players specialized at just one position. From 1945 t0 1963, his record was 141-49-13 for an excellent .727 win-loss percentage, while from 1964-1982 he was 182-36-4 for an awesome .829. No other football coach who had to make the adjustment from limited to unlimited substitution in the game even begins to compare. Besides being born in the same year, Bryant’s and Lombardi’s lives shared an amazing number of similarities. Both men married young and stayed married to the same woman their entire lives. Both had two children, a son and a daughter, —and both sons were named after their fathers. Their football mentors—Jim Crowley at Fordham for Lombardi and Frank Thomas at Alabama for Bryant—learned the game under Knute Rockne at Notre Dame. Both won their first championship in 1961. They each developed close and lasting relationships with rebellious prodigies—Lombardi with Paul Hornung, Bryant with Joe Namath. And both, of course, were uncompromising taskmasters who stressed fundamentals and discipline. They nearly played against each other when Alabama met Fordham at the Polo Grounds in New York in 1933; Lombardi was ineligible for Fordham’s varsity squad but was in the stands that day. Lombardi’s impact on pro football has faded; he has no protégés or disciples still in the game. But The Bear’s influence still pervades every level of the game, from small colleges to the pros. Joe Namath, his most famous recruit, helped bring out about the merger of the American and National Football League. Ozzie Newsome, one of Bryant’s first black All-Americans, is currently general manager of the Baltimore Ravens. John Mitchell, the first black player to start for the Crimson Tide and Bryant’s first black assistant coach, is now in his 20th season as defensive line coach for the Pittsburgh Steelers. And Sylvester Croom, who starred at center and later served as an assistant coach for Bryant, became the first black coach at a Southeastern Conference school, Mississippi State, in 2004, and is the new running backs coach for the Tennessee Titans.